You cannot be into manga without having hearing that name mentioned at least once every few months of your otaku wanderings. Osamu Tezuka has come to be known as the grandfather of manga – the pioneer of the medium – and his works like Astro Boy and Kimba the White Lion have been staples in both American and Japanese popular culture. Unfortunately, my problem with Tezuka is that he’s at least one generation away from me and my tastes. The man died when I was only five, and most of his work would be better known from my father’s childhood than my own. So while I recognize Tezuka and his place in manga history, I have never read or watched any of his work and mostly stuck to the comics and anime of my generation. But Tezuka, like most fixtures of pop culture’s recent past, is making a comeback in the 21st century with many of his works finding a refresh in recent years. Niche publisher Vertical is leading the manga charge by diving deep into the Tezuka archives and releasing many of his works to the American audience. Thanks to this publisher, decades-old titles like Dororo and MW are now being seen in English for the first time ever. At the forefront of Vertical’s Tezuka revival is Black Jack, the story of a rogue doctor who’s purpose in life is to save anyone who needs saving, despite the circumstances or option of payment. The series has seen almost universal approval from the manga community since its stateside release. So when Vertical’s brand new marketing director Ed Chavez offered up review copies of their fifth Black Jack collection, I very eagerly requested a copy to find out what all the hype’s been about. And wow, now I know, because reading Black Jack has changed my view and perception of the medium I thought I knew completely. First of all, the fact that I started off reading the series at the fifth volume didn’t really do me any harm. Black Jack does not contain a serialized storyline, so it’s completely fine to jump in at any chapter, and it doesn’t even matter what order you read it in. Each one of the 20-page chapters contains its own independent story. 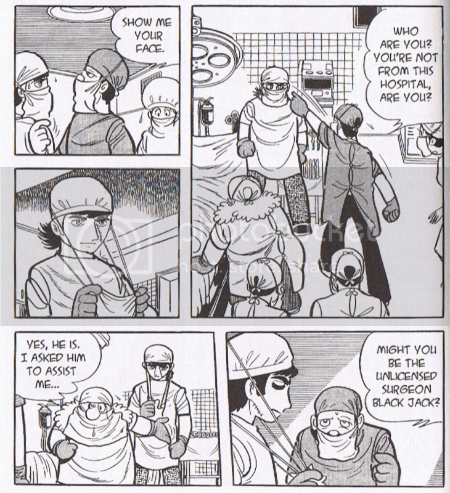 A person goes to Black Jack seeking his medical assistance, and the character’s back story is told with in the chapter along with the scene of Black Jack’s operation and the recovery of the patient. But one of the issues with the story is that many of these episodes tend to end abruptly with an unexpected and unsatisfying conclusion. After saving the life of a young actress, she suddenly commits suicide in the last page. The End. After spending a whole episode helping a woman correct her facial deformities, the final page shows her getting gunned down. The End. Or after spending an entire episode trying (and succeeding) to save a rival’s sick father, the old man dies anyway because the son poisoned him at the last minute. The End. But perhaps these unsettling endings add to the unique and generally refreshing tone that this comic presents, because man, did I enjoy reading this book! The character of Black Jack, the doctor not pressured by money or greed but by the need to save others, becomes one of the most pure and motivational people ever to be portrayed in the medium. It is simple in concept but downright religious in practice, an in that way, Black Jack becomes the Jesus figure in this humanitarian bible. The story also provides an interesting look into the medical field. 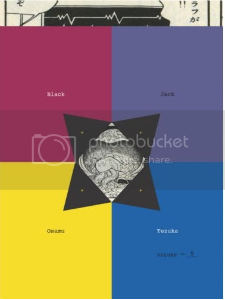 Tezuka actually studied medicine and received his degree before deciding to get into manga, so while the medical parts of Black Jack are highly exaggerated and laced in the fantasy and paranormal, it does have a genuine feeling of authenticity to it. But sometimes Tezuka gets a little too authentic, and doesn’t hold back in the disgusting and displeasing gore that comes with the medical profession. Bodies are spliced open on the operating table, and clamps hold back the skin while Black Jack and other doctors poke and remove the various internal organs. Limbs are severed and laid near the patient’s body while the victim is fully awake and under a local anesthetic. The book can get just as gory and gruesome as any violent horror story. The overall art style of Tezuka has been the main reason why I’ve stayed away from his work in the past, and I’m still displeased with it in Black Jack. Tezuka’s style was heavily influenced by early Disney and Betty Boop cartoons, and his character designs have been cited as the influence behind the “big eyes” we associate with modern anime. But anime character designs have evolved tremendously since then, and although Black Jack was published in the later part of Tezuka’s career, his character designs still bare a striking resemblance to Disney and the American cartoons of the past. This is very, very off putting to a manga fan who turns towards Japanese comics because of how “un-American” they are. Still, the reason why I can nitpick all the downfalls of Tezuka and his Black Jack series is because I found myself so completely and utterly drawn into this book. This isn’t your regular manga, this is better than your regular manga, and reading it felt like I was rediscovering the medium all over again. The Good: An absolutely refreshing comic unlike anything that modern manga has to offer. The Bad: Artwork outdated. Medical scenes a bit nauseating at times. Many episodes have unsettling endings. Final Verdict: Believe all the hype. Black Jack is a fantastic comic, and you can expect this long time manga fan to continue to dive back into the archives to read more from the grandfather of manga himself. This entry was posted on Monday, May 18th, 2009 at 9:15 pm by Scott	.